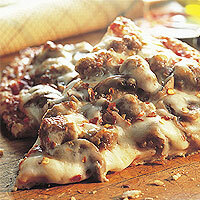 Italian sausage, mushrooms, provolone, and tomato sauce delivers a taste of Italy to the table. Heat oven to 450º F. Spread pizza crust evenly with sauce, one cup cheese, sausage, mushroom, and remaining cup of cheese. Bake directly on oven rack for 10 minutes, or until crust is crisp and cheese is melted.